HELP ME SING BETTER! - Here is a video demonstration of the longheld "Nooo" exercise. Help Me Sing Without Getting Hoarse!!!! I often receive messages from singers who complain about having a raspy voice after singing. 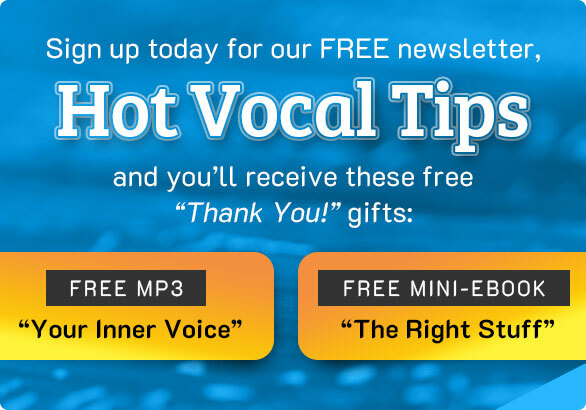 One newsletter reader, Thomas M., recently wrote: "Often after singing my voice becomes raspy the next day, making it impossible for me to hit high notes. What do you suggest?" But, in my long experience as both a singer and vocal coach; we singers usually know if we are singing well and with ease. Often, when you find yourself hoarse and unable to sing the upper notes, it is because you have been straining or pushing your voice too hard in your practice or performance. How you warm up daily can have strong impact on how you sing. If you do not have a regular singing teacher who can help you to overcome vocal habits that strain your voice, I suggest that you incorporate some exercises into the early part of your warmup that promote balanced and strain-free singing. ADVICE from a vocal coach (in person ideally... or online) so that you can approach your warm up with more confidence. Having a raspy voice now and then is par for the course. But if this happens to you regularly after you sing, consider revising your warm up. HELP ME SING IN A BALANCED WAY! Start with an exercise like the one I have demonstrated below. Co-ordinate your breath with your vocal cords early in your singing day so that your approach to creating sung sound is clean and well balanced. Read more about the value of the "Nooooooo..." exercise from a speech therapist here: Sore Throat Remedies. I Wish You Great, Smooth and Well-balanced Singing!